To put it lightly, Monday was pretty ugly for the Atlantic 10. Saint Joseph’s got the afternoon action underway when they took on N.C. State in the Paradise Jam tournament. Unfortunately for A-10 fans, the Hawks 73-63 loss set the tone for the day as a whole. Arkansas Little Rock surprised St. Bonaventure and pulled off a 68-65 upset. Houston absolutely pounded George Mason 93-56 in a game which the Patriots looked totally out of sync. George Washington put up a fight, but ultimately fell to Georgia 81-73. Finally, in the late night game, Saint Louis lost to BYU 92-62. While the Billikens did manage to hang around, their second half collapse put a cap on the A-10’s brutal day. In their first game at the Lone Star Showcase, the St. Bonaventure Bonnies struggled mightily. Down 10 to Arkansas Little Rock at the half, St. Bonaventure just could not get anything going. Despite the deficit, the Bonnies battled back. Led by Jaylen Adams and Matt Mobley, St. Bonaventure nearly managed to escape with a win. Little Rock did not falter down the stretch, however, holding on to win 68-65. This loss drops the Bonnies to 1-2 on the season, but they still have two more games to play in the showcase before returning home. As usual, Jaylen Adams carried the load for St. Bonaventure in this game. Adams dropped a team high 18 points to go along with four assists and three rebounds. Emerging co-star Matt Mobley also had solid game as he scored 15 points, pulled down eight rebounds, and dished out four assists. While both Adams and Mobley consistently produce night in and night out, the Bonnies need other guys to establish themselves as reliable threats. Hopefully St. Bonaventure can forget about this upset, move forward, and reach its full potential. With a potential match-up against #5 Kansas in the CBE Hall of Fame Classic tournament championship awaiting the winner, George Washington took on Georgia in a showdown. This game was truly a battle from start to finish as both the Colonials and Bulldogs played with a lot of heart. Each team traded buckets throughout, but only one could escape this tightly contested shootout as the victor. Using a mini run with about 10 minutes left in the second half, Georgia fought off George Washington. J.J. Frazier and Yante Maten scored 18 point apiece to help the Bulldogs grab a 81-73 semifinal win. Despite the loss, George Washington saw some really good things out of key players. With 21 points and six rebounds, Tyler Cavanaugh led the way for the Colonials as he typically does. Senior guard Matt Hart caught fire from behind the arc. Shooting 5-6 from three, Hart dropped 17 points to be George Washington’s second leading scorer. Yutu Watanabe did all he could to keep the Colonials hopes alive late in this one. 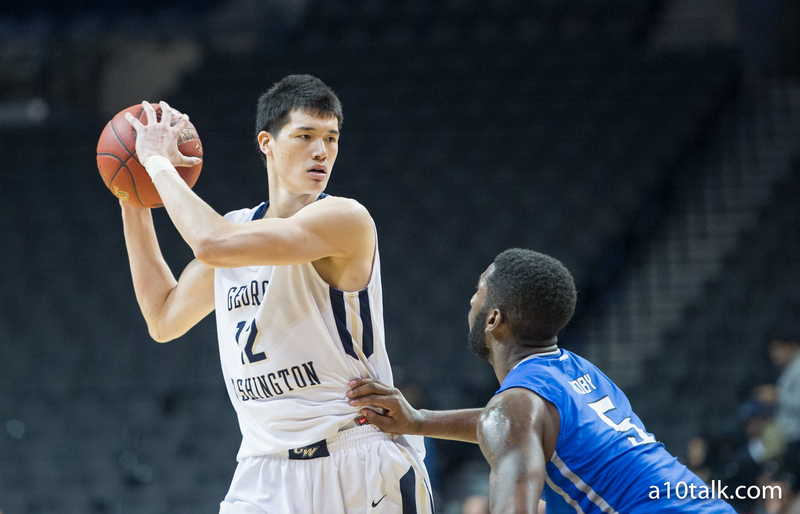 Watanabe scored 14 points to go along with three rebounds and three assists. Unfortunately George Washington, the efforts by these three leaders proved to be not quite enough as the Colonials suffered their first loss of the season. The 3-1 Colonials will try to prove this loss was only a minor slip up as they get set to take on UAB before heading back home. Coming off a loss to Ole Miss, the Saint Joseph’s Hawks looked to rebound against N.C. State. Seeking a bounce back win of their own, however, the hungry Wolfpack put up a fight. Thanks to a 24 point outing by freshman guard Dennis Smith Jr. N.C. State came away victorious. Shooting just 33% from the field, Saint Joseph’s could not muster up any offense as the Hawks fell 73-63. On a day that nearly everyone in a Hawk uniform struggled, Shavar Newkirk put together a very solid performance. With 23 points, six rebounds, and five assists, Newkirk did all he could to help Saint Joseph’s stay in this one. If the Hawks want to make this season successful, they must figure out which role players will step up consistently. Saint Joseph’s returns home on November 30th for a big game against Temple. The Hawks need to defeat the Owls and get back on track.